That’s an interesting article I read on MSN today. Sometimes we think that some things are just common sense and not worth writing about or telling others about. However, every airport has its share of people who travel wearing the most weirdest clothes, accessories or footwear. I personally like to travel in comfortable clothes so its either jeans or cotton trousers and a top or kurti with trainers or my fit flops.Depends where I am going to. Colder areas, I put on jeans and trainers. Warmer areas call for cotton trousers and fit flops. We all love to smell pleasant on a flight but its best not to wear overpowering scents. So the writer recommends comfortable clothes but no skimpy clothes and obscene messages displayed on tops and t-shirts. Strong scented perfumes and food is a big no no. Stilettos and platforms are best left for the fashion ramp or parties and not flights and airports. I wonder how women in stilettos ever manage to walk fast if necessary at the airport. Over sized coats are not only a bother to you but your co passengers as it tends to occupy too much seat space. If you are not wearing it then it still occupies a lot of space in the overhead bins. Too much jewelry is a bother not only to you but the co passengers when we have to go through security checks. Best to leave all the bling bling at home or in your hand luggage. Bad smelling passengers can make one faint especially if you are the unlucky one sitting next to them on a long flight. Its all about etiquette and being mindful of others. 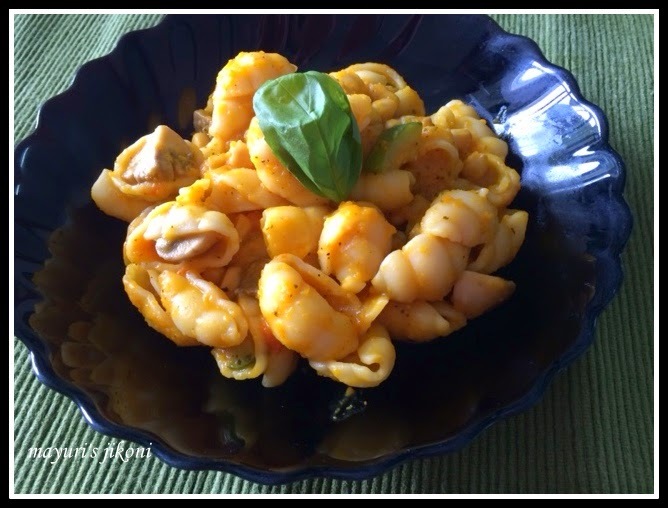 Today’s recipe is a pasta dish…yes one after a very long time. I made the sauce with butternut squash and it tasted creamy without the creamy and different from the usual tomato or white sauce. Try it… its nice. We get butternut squash nearly thorough out the year so for us its not a winter vegetable. Well its not a vegetable but is classified as a fruit but one that has to be cooked. Have you had a bad flight because of a co passenger? Add mushroom and zucchini chunks along with the sage leaves. Stir fry for a minute. Cover the pan and let the vegetables cook for another minute.You don’t want to overcook the vegetables. Take the pan off the heat. Add sweet corn,cooked pasta and salt. Mix well. Keep it on the side till required. Cut the butternut squash into half. Scoop out the seeds and fibrous bits. Place the butternut squash in an ovenproof dish. Scatter garlic and sage leaves over the halves. Place the butternut squash in the oven and roast it for 30 minutes or till done. Take it out of the oven and let it cool down a bit. Cut the butternut squash into chunks. Process the butternut squash along with the garlic, water and sage into a puree. Add salt, pepper, chilli powder and lemon juice to it. Add the butternut squash sauce to the pasta mixture. Mix well and heat it up. Serve with your favourite grated cheese,extra chilli powder or chilli flakes. This is a very interesting sauce I am sure it tasted great.I shall book mark for my friend who has a tomato allergy as she can try this instead of the classic tomato sauce on pasta. This is indeed a very innovative and healthy sauce recipe. The sauce with all my favourite spices and lemon sounds wonderful. Good tips when travelling too. I always like to be comfortable when I am travelling.